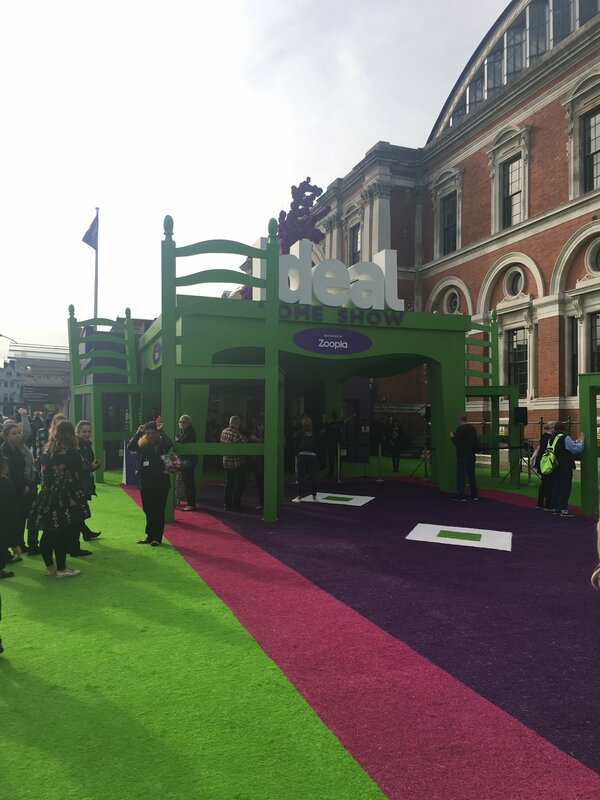 The Rug Seller were eager to travel down to the UK’s capital city London to attend The Ideal Home Show 2017. We’ve always heard great things, so we were really excited to visit. As we are an interior design-orientated company, we couldn’t wait to go! 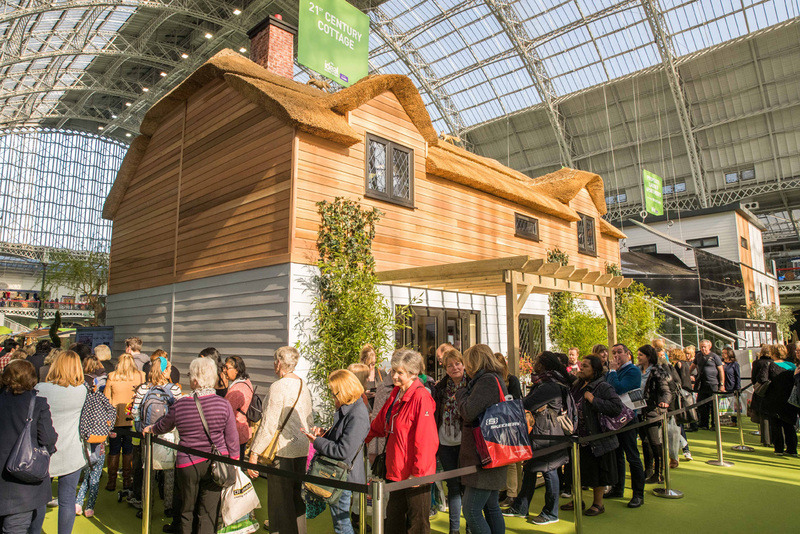 For homebodies like us, The Ideal Home Show is a good place to browse, maybe shop, and tinker around in all things home related. As we walked up to the Ideal Home Show, the first thing we saw were lovely groups of homey loving folks eager to check out new interior goodies. However, inside we were blown away – Kensington Olympia is HUGE! You could spend the entire day there and still feel like you only scratched the surface. We headed upstairs first and glanced down from the balcony on the 1st floor to get an overall vast idea of what was going on and where everything was situated. 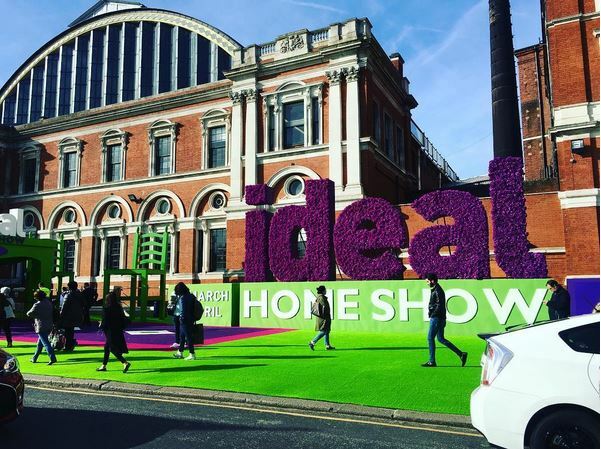 From above, we could see all the different sections including Gardens, Home Accessories, Style and Interiors – which are some of the highlights of the Ideal Home Show! Simply because of what they had on show, such as a model home. 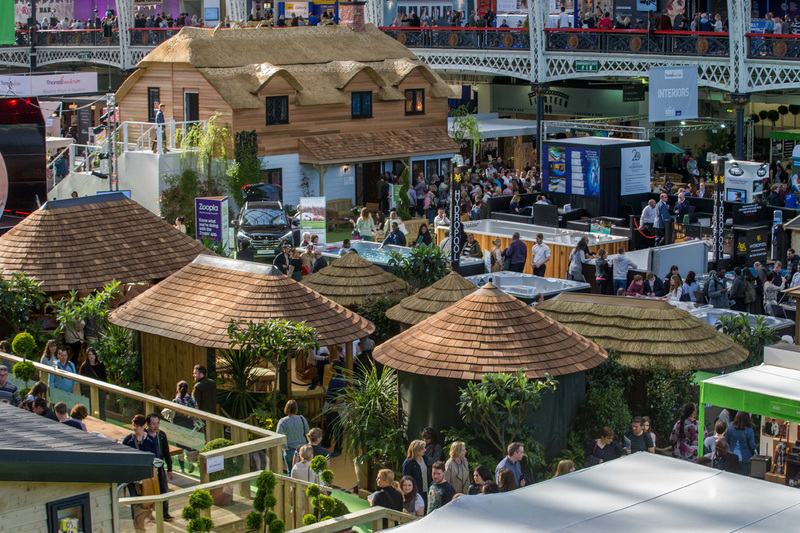 The main floor is where all the big exhibitors stands are, from Thomas Sanderson & 21st Century Cottage to Loft Living & Property Ladder Apartments and loads more. They have gardens, interiors and home improvements on the ground floor. We took a wander around the exhibits and snapped some pics of our favourite furniture pieces, as well as taking a few notes for things to come back later for! Looking inside these model homes, also let us see how rugs can be a HUGE part of completing a room – even a minimal room. We’re slowly making our way towards an interior refurb at The Rug Seller, so it was nice to get some inspiration. So, upstairs is where all the food stands and shopping areas are. We decided to have a quick browse around all the different sections in order to get a grasp on what they were offering or selling – Eat & Drink, Home Accessories, Beauty & Technology – it was interesting to see other home related stands in action. People walked past loaded with shopping bags and freebies of the latest gadgets and trinkets. Some people even came with trolley bags. 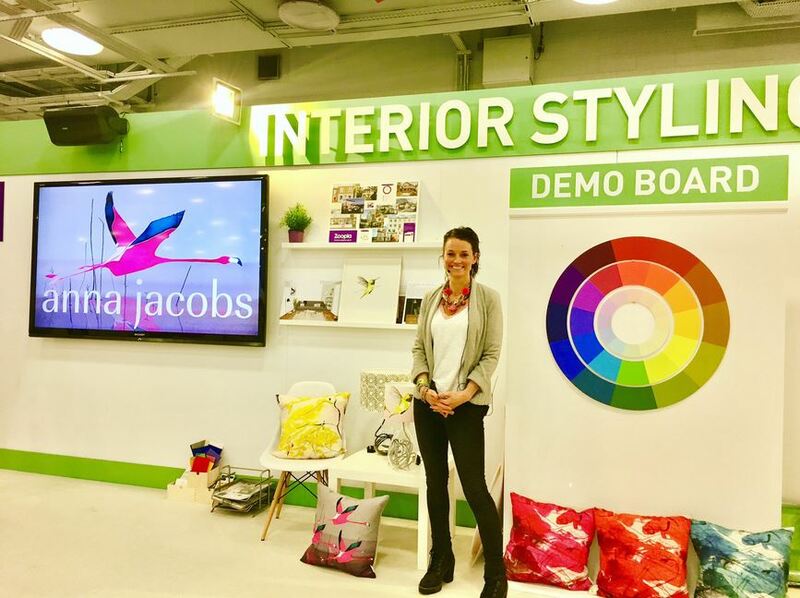 New to this year’s show the Interior Styling Stage offers the latest trends in styling your home. One of our favourites Anna Jacobs was able to demonstrate the process of choosing colour for your home in a beautiful step by step guide. You’ll never be overwhelmed by choosing colour again! After scoping out the layout of the exhibition, we decided that taking time out was a must. So, we went in search for food at the Eat & Drink Festival where all the food stands were. It’s crazy in the food area! As we wandered around, we got samples of fudge, cheese, wine, spirits, sushi… you name it. We then made a simple pit stop for a quick snack of hot dogs for lunch, and as it’s so packed it was hard to find a place to eat lunch! We took some seats at the Ideal Eat & drink demonstrations – there were loads of juicers being demonstrated and free juice being handed out. There were cafés within the hall too, but we wanted to enjoy the stands at the heart of the show! 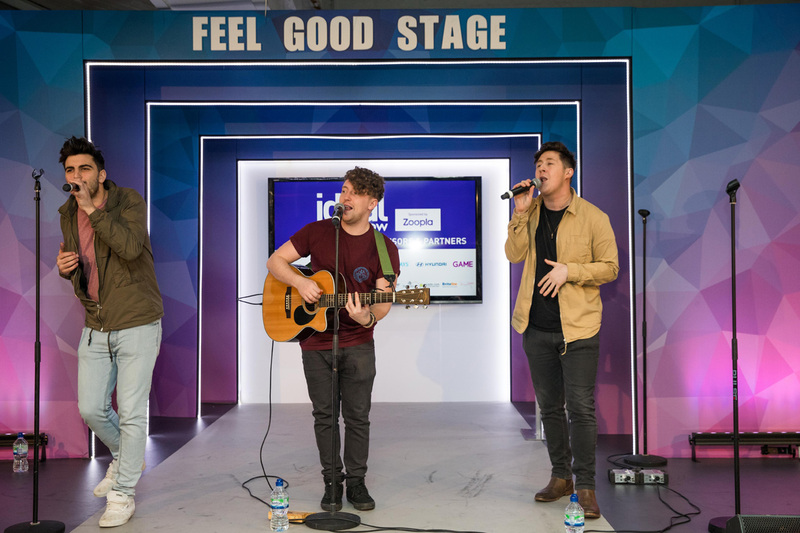 New to the Ideal Home Show 2017 was the Feel Good Stage! It was great for two things – whether we needed a little boost or just fancied some top-class musical entertainment. We managed to catch a few presentations, but these were our favourites – Enchorus, West End Kids and The Tailormade. Which were all so amazing to watch perform! From world-class performers to top TV fashion & beauty gurus perfect for anyone with a passion for fashion, there will be a whole variety of talent to get you feeling good for 2017. The Ideal Home Show is the home of fabulous shopping but it’s a big show and getting around it can be hard on the feet! 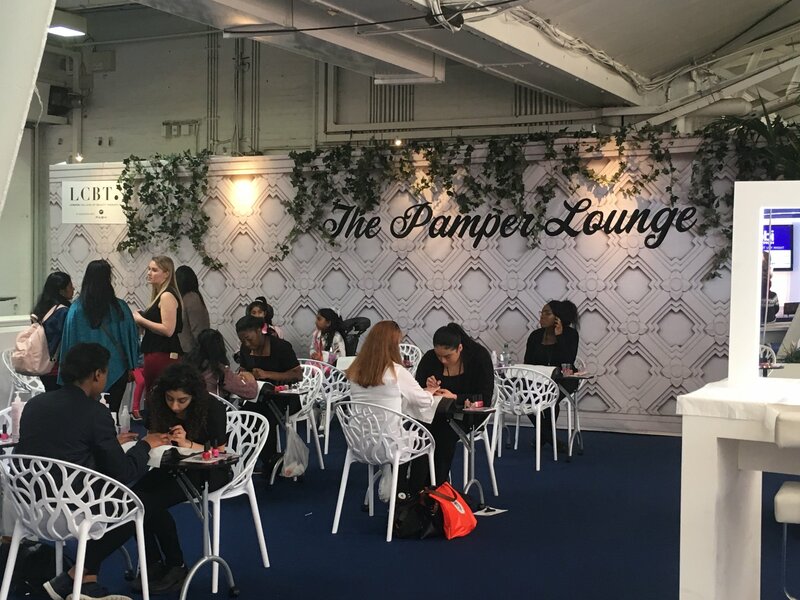 Fortunately, there was a pamper lounge where we could relax, indulge in a glass of bubbly at the Rosé Bar, browse the latest products and pick up hints and tips on this seasons fashion trends. This stage was the perfect place to rest our feet and chill! We headed back to the entrance to the Ideal Home Show. We had such a grand day and we’d thoroughly recommend visiting. 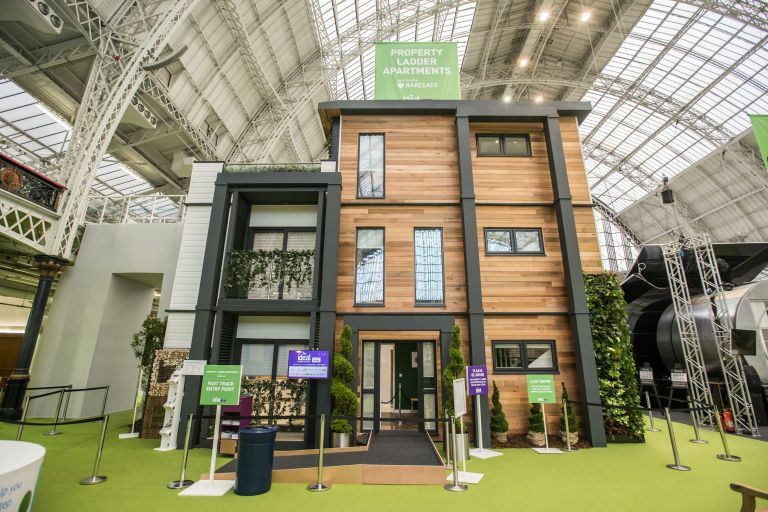 It’s worth dedicating a few days to visit, if you really want to scout out the best offers and experience some of the show homes or demonstrations. 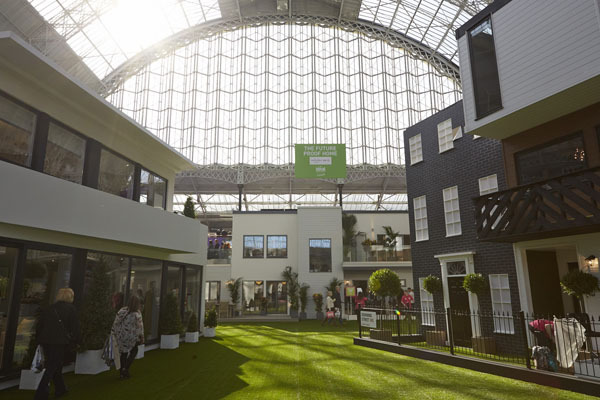 Pantone’s colour of the year, Greenery, is something which was certainly represented at the Ideal Home Show exhibitions this year. The relaxing shade is a perfect choice if you want to revitalise and refresh your home this Spring. This helps with homebodies wanting to add some bright, colourful touches to their home. From bright limes to serene emerald hues, these colours can work throughout your home in various ways, whether it be a rug, throw or bedspread. Also, think about adding some well-placed house plants for an even bolder look. Similarly, this year we’ve seen a big rise in the popularity of tropical-themed home accessories. 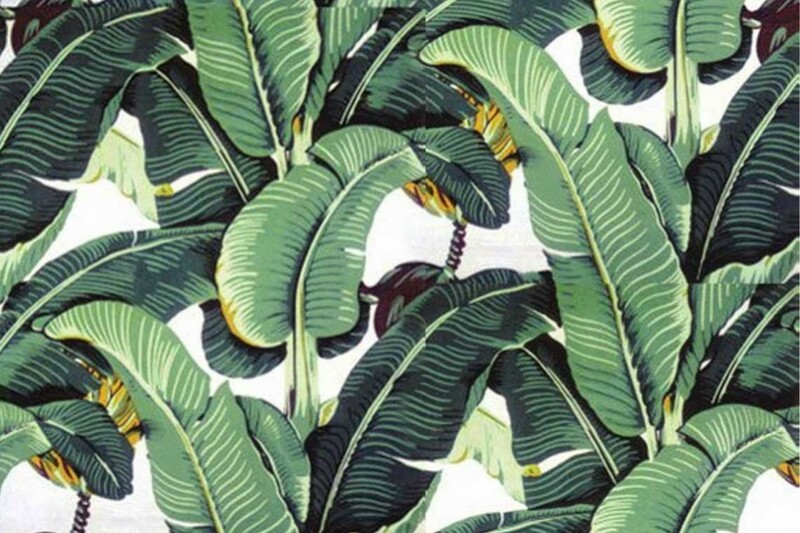 This big tropical interior theme fits in with ease by mixing a range of tropical-inspired prints in green and white. Tropical style home accessories are characterised by a vibrant exotic colour palette and/or quirky motifs such as pineapples, flamingos and cacti, and are therefore just the thing for instantly adding some warm summery charm to a room! 1) The queue for the model show homes is much more bearable towards the start and end of the day. We queued near the start of the day and there was barely anyone in the queue. However, during the middle of the day, we saw people queued for ages to see one home. 2) Go early in the morning to get a parking space and extra freebies. Also, be prepared for it to be busy inside and for the car park to be full. 3) There is food around! There are cafes inside the hall, but at first, we couldn’t find any and headed straight to the food stalls. It was tasty but we would have preferred sitting down somewhere nice and taking our time. The best one we saw was on at the far end of the main floor. 4) There’s a cash machine outside Kensington Olympia station, it’s worth stopping off here as there isn’t much of a queue (usually). Taking cash makes life easier! 5) Chat to exhibitors – ask about competitions and vouchers! Subscribe to newsletters and blogs, because you never know what competitions may come up in future. If you are a blogger or business – don’t forget your business cards! Lots of connection opportunities here. 6) Presentations are repeated throughout the day, so if you only catch the last part of something, check the timetables for when it returns. We did this for Julia Kendell’s Weekend Transformations. We hope you have a brilliant time! And do make time to watch the demonstrations – they are really very helpful. 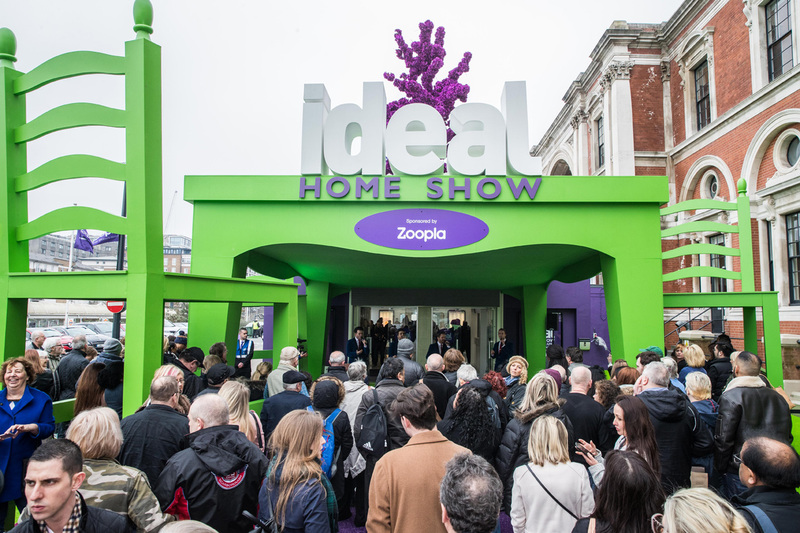 Have you ever been to the Ideal Home Show or thinking about going? Let us know in the comments! It is usually every March/April every year for about a length of 17 days, this years started on Friday 24th March and ran until Sunday 9th April. Also, it is coming to Glasgow in May and Manchester in June 2017 – if they’re closer to home. So, if you’ve missed the London one, make sure to grab your tickets for these next two events. Disclaimer: All images used are from The Ideal Home Show Gallery.